This is something I've meant to write for a while. It's about Tim Pool and his commentary in the wake of the Toronto van attack. 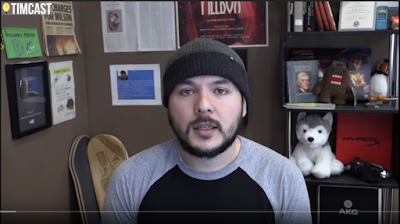 If you don't know who Tim Pool is, he's a journalist and YouTube personality who gained prominence in 2011 while documenting the Occupy Wall Street demonstrations. Pool's two YouTube channels have a combined 580,000 subscribers and 128 million views, and he uploads about five videos each day. The videos mainly consist of Tim's commentary about the news, but he also mixes in interviews and live-streaming from protests and rallies. Tim Pool worked at Vice for a while, and then he worked for Fusion. Evidently the culture at Fusion left a terrible impression on Pool, and lot of his commentary is now focused on highlighting what he perceives as the mistakes of mainstream liberal media—not just at Fusion, but at CNN, BuzzFeed, the Huffington Post, etc... Thus, you'll find videos on his channel like "If We Are Going to Ban Fake News Lets Start With CNN," and "BuzzFeed Tried to Call Out The 'Far Right' and Got It Wrong.. I consider these videos a guilty pleasure, but I often get the nagging feeling something is "off" with Pool's criticism. For instance, in that video where he suggests CNN is fake news, he brings up the time when Don Lemon cited speculation on Twitter that Malaysian Flight 370 could've been swallowed by a black hole. It was certainly an eye-rolling moment, but I viewed it more as an awkward segue on Don Lemon's part than as some classic example of "fake news." The problem is that it was the type of moment which can be interpreted subjectively—and whether it's "fake news" depends on your personal opinion of CNN. For this post, I want to focus on something objective Tim Pool covered. Something which was definitely real or definitely fake. 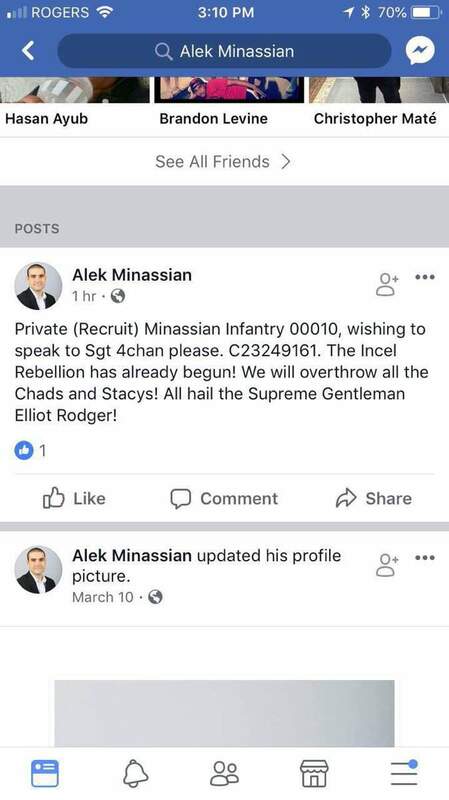 The implication was that Alek Minassian considered himself an incel (short for "involuntary celibate") and that he'd committed the violence in honor of Elliot Rodger, who in 2014 killed six people (and then himself) in Isla Vista, California. Rodger filmed a video prior to the murders in which he blamed his unhappiness on his lack of success with women and vowed to exact revenge. Granted, just because the Facebook page was "real," that doesn't mean Alek Minassian himself wrote the post. But this seemed to dispel the idea of the Facebook page itself being a hoax. Tim Pool, however, took a look at the story and wasn't convinced. In four different YouTube videos, Tim Pool asserted his belief that the Alek Minassian Facebook page was a hoax, and that the media was spreading a fake narrative. He even said the journalists spreading this type of fake narrative were "evil." Pool first mentioned the Facebook post in an April 29th video, titled: "Incel Revolution: Was an 'Involuntary celibate' behind Toronto Attack?" I’ve been doing a lot of digging and looking into it, and I really believe this story is entirely fake. There's basically no evidence to suggest this is actually an incel...I think it is fair to say the media is running with a fake story and I think it is fair to say that this Facebook page is a hoax. Pool was more emphatic in a May 18th video, titled: "The Truth about Everything." This is fake news....I bet everything, I bet my car, that this incels thing is fake news....Somebody made a Facebook profile and then added a post where it was just one photo....There were no friends on this profile. It looked like a brand new profile with two posts. And one of those posts was this guy saying that he was an incel. You can edit the dates on posts. You can edit your page, and make it look like you posted something months ago. And that’s all it was...There is absolutely no reason to believe this is true...It was an archive that's highly dubious, that was probably made by some trolls. We have no reason to believe it's true. There's no confirmation. Yet it will go down in history that this man was an incel like many of these other shooters, like Elliot Rodger....When the New York Times runs a story where they say Alek Minassian was an incel, that's not the truth....A fake profile is not proof. Pool was near exasperation in a May 19th video, titled: "Is This The Breaking Point / Is Truth Really Over?" There isn't any truth...You've got people who are ideologically driven, who are just going to push the narrative that they want to exist. These people, in my opinion, really are evil... What [the media is] doing is publishing unconfirmed rumor and a potential hoax as a fact. Because what constitutes facts these days? Apparently, very little. Going back in time, let's talk about this Facebook post. This is apparently a post from the attacker saying 'The Incel Rebellion has begun. All hail Supreme Gentleman Elliott Rodger.' 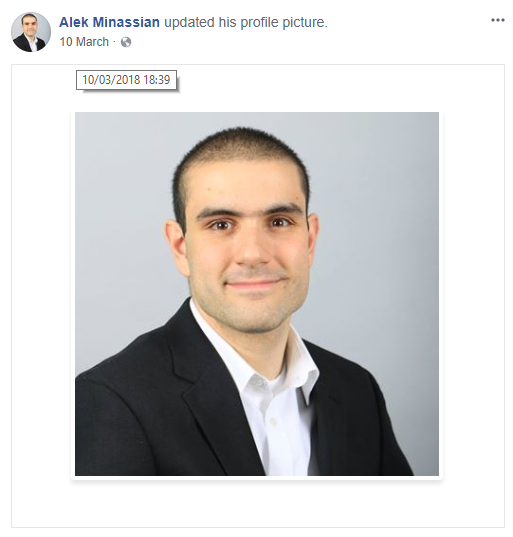 Following that story, there was a wave of news articles from various mainstream outlets, talking about how incels were dangerous, they were the new boogeymen, and definitively stating that this guy, this Alek Minassian, was an incel, based off of this highly dubious archive of a Facebook post. 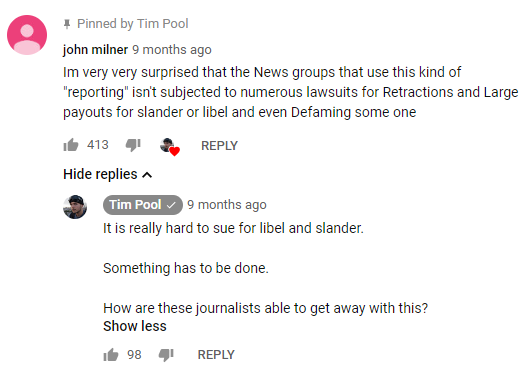 Pool talked about the story again in a May 22nd video, titled: "I'm Fed up with these people." When I first watched these videos, I genuinely thought Tim Pool was on to something. So I dug into the story myself, and...for the life of me, I couldn't figure out how Tim Pool reached the conclusion that he did. In my judgement, the evidence all suggested the Facebook profile was real. My first step was to gather the various screenshots and archives floating around social media. I found three distinct screenshots. The earliest appearance of this screenshot was in a 4Chan thread on April 23rd at 5:58 PM, Eastern time. The screenshot shows a Telus phone, displaying a time of 3:15 PM. 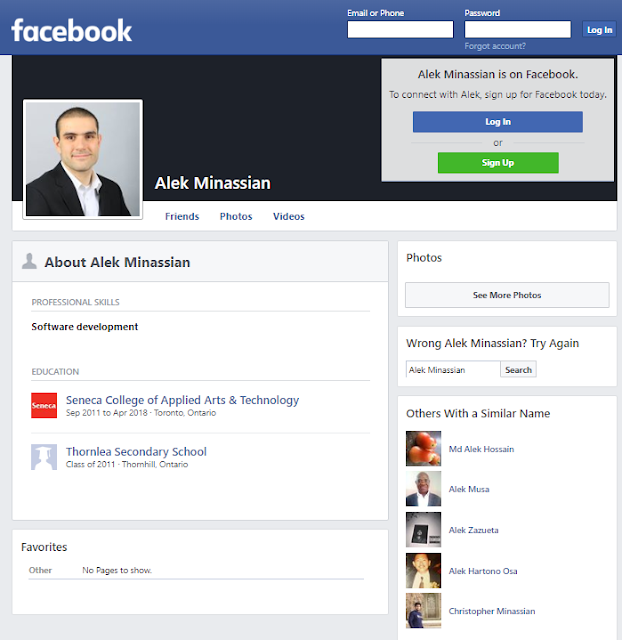 Two of Alek Minassian’s posts are visible. The “Incel Rebellion” post has a "1 hr" timestamp. The other post says “Alek Minassian updated his profile picture” and is dated March 10th. All of the above screenshots and archives are compatible with each other. I don't see any contradictions. So now I'm going to review some of the claims Tim Pool made in his YouTube videos and explain why they don't make sense. Claim #1: You can edit the times and dates of your Facebook posts. Two things immediately became clear. First, a clock icon appeared next to the timestamp when I backdated my post. The same clock icon even appeared in an Archive.is snapshot of my post: http://archive.is/pgTqr. Second, I had to choose from among 10-minute increments when setting the time: 2:00 PM, 2:10 PM, 2:20 PM, etc... So the new timestamp would only show a time ending in "0." I realize it's been 10 months since the post was created, and Facebook could have changed its features in that time. For what it's worth, I ran this experiment with a dummy Facebook account back in May, 2018, and observed the exact same thing. I also found a conversation on StackExchange from July, 2017, which referenced the clock icon: A user asked: “Is it possible to backdate a Facebook post WITHOUT the little clock icon indicating that you've done so?” Another person replied: “No, it is not possible to backdate a Facebook post without the little clock icon indicating that you've done so. That shows the edit history.” So I don't think the clock icon is a new feature. 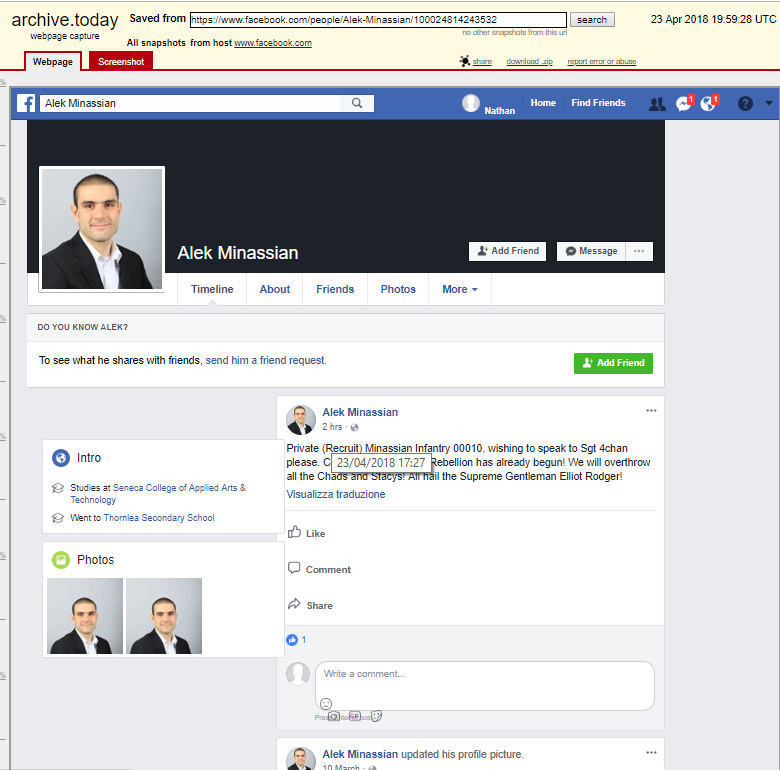 Two of the screenshots clearly show Minassian had Facebook friends. There were also questions raised about the timing of the post. An archive of the Facebook page appears to show a timestamp of 1:27 p.m. EDT, shortly after police started receiving calls about a van that had jumped the curb and struck pedestrians. 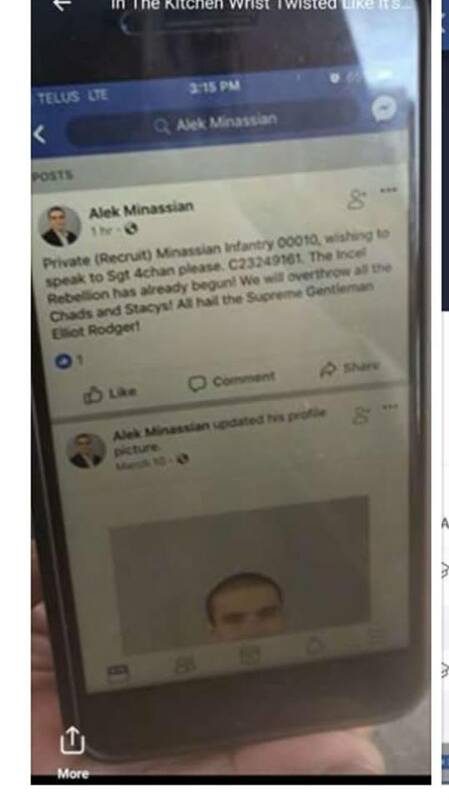 An image of the Facebook message, which was posted anonymously to 4chan, suggested it was published at around 2:15 p.m., however, when Minassian would have already been in police custody. That passage, however, is based on a misunderstanding of how timestamps on Facebook work. When a timestamp says “1 hr,” it means the post was published more than one hour ago and less than two hours ago. The 4chan screenshot showed the post had a “1 hr” timestamp at 3:15 PM, meaning the post was published between 1:15 PM and 2:15 PM. This is consistent with the Archive.is snapshot that showed a timestamp of 1:27 PM. I'll cut the Toronto Star some slack in this instance. Tim Pool, on the other hand, literally makes videos about online hoaxes. He built his brand on social media. I would expect him to know how timestamps work, and yet he shared that passage uncritically. The cryptic numbers in the Facebook post attributed to Alek Minassian — C23249161 — are the same as his service number with the Canadian military, a defence department source confirmed to the Star Wednesday…While many people have questioned the authenticity of the Facebook post — including media manipulation experts, who warned of online hoaxes in the wake of mass killings — few people can access Minassian’s service number, which is akin to a social insurance number and subject to privacy restrictions. If the Facebook post was a hoax, it would mean the hoaxer somehow knew Minassian's service number. As I mentioned earlier, several journalists reached out to Facebook for confirmation. Facebook confirmed to the BBC that Minassian was the author of a post which read in part: "The Incel Rebellion has already begun! We will overthrow all the Chads and Stacys! All hail the Supreme Gentleman Elliot Rodger! A spokesperson for Facebook Canada would not answer specific questions about the timing of the post, but said the company believed it was legitimate and deleted the account, which had been made with Minassian’s name and photo. “This is a terrible tragedy and our hearts go out to the people who have been affected. There is absolutely no place on our platform for people who commit such horrendous acts,” spokesperson Meg Sinclair said in an email. Here's the puzzling thing: Tim Pool showed that same excerpt from the Toronto Star in his May 19th video. However, twenty seconds later in the same video, he repeated his assertion that the Facebook post was "not confirmed." So I have to wonder: Did Tim Pool think the Facebook spokesperson was wrong? Did he think the Facebook spokesperson was lying? Did he think the Toronto Star misinterpreted her statement? If Tim Pool said, 'I don't trust the words of a Facebook spokesperson," then I could at least understand where he's coming from. But he doesn't elaborate. Aside from Facebook officials, there were a few other potential sources of confirmation. The Toronto Police Service gave a press conference on April 24th, during which Detective Sergeant Graham Gibson acknowledged the "Incel Rebellion" Facebook post. Sergeant Gibson said the police would be investigating the post, although he stopped short of confirming the post was written by Minassian. NBC News, for their part, cited law enforcement officials as saying Minassian had an online discussion about Elliot Rodger. A source who witnessed exchanges with people in the jail said Minassian said that he “hates the Chads and Stacys,” which is something referenced in the Facebook post. Is it possible Joe Warmington made up the details in his article? Sure, I suppose. The guy doesn't have a stellar reputation: A writer at Torontoist.com once called out Warmington for his "shameless hackery." Another writer at the Toronto Star called Warmington "an embarrassment to our industry." With that said, the Ontario government treated the article seriously enough to launch an investigation into the apparent leak. The frustrating part about writing this analysis is that I can't be 100% sure the Alek Minassian Facebook account was real. My hunch is that it was real. I haven't seen any convincing argument for why it would be a hoax. Minassian's trial is scheduled to begin in 2020, and I imagine at that point we'll get some definitive confirmation. I'm a regular viewer of your show, and recently I was looking into the controversy from last spring regarding Alek Minassian (the man who allegedly killed 10 people in Toronto). 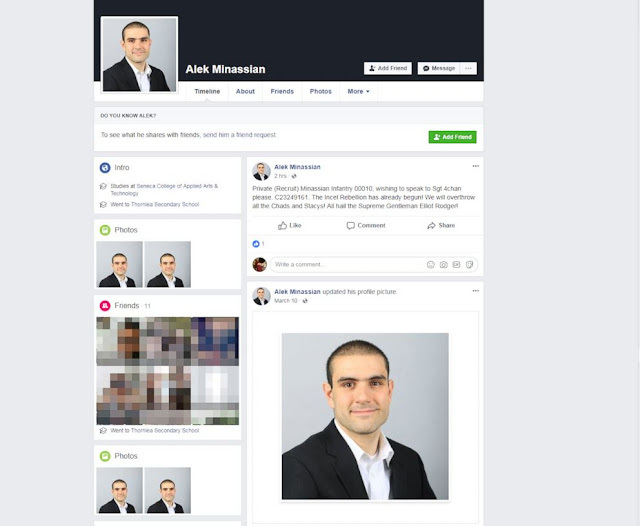 The media claimed Minassian was an incel, and the claim was based on an archived Facebook post. At the time, you said you thought the Facebook post was a hoax. Has your opinion changed at all since then? For what it's worth, I did find a Toronto Sun article from April that implied Minassian was talking about his Facebook post while in jail: "And sources confirm Minassian was talking openly about his Facebook post and his disdain for women." Minassian's trial is set for 2020, so it could be a while before we get a definitive answer, but I was curious to know your current thoughts on the matter. Pool didn't reply to that e-mail, but I'll update this post if he does and we'll keep the conversation going. 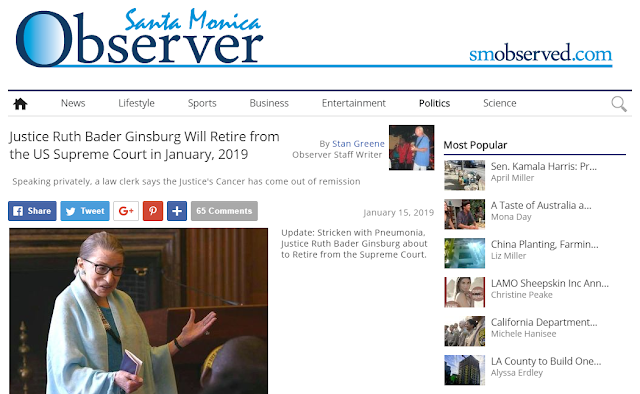 The Santa Monica Observer published an article titled, "Justice Ruth Bader Ginsburg Will Retire from the US Supreme Court in January, 2019."